A standalone GPS? In 2018? In 2018, you could be forgiven for thinking standalone GPS units are as useful as dial telephones. Who doesn’t have a smartphone with GPS built-in? Today’s mapping systems give you everything you need, so why would you bother with a standalone GPS, at any price? Believe it or not there are some good reasons. I know it’s stupid but laws haven’t caught up with technology. In California it is still against the law to touch your phone while you’re driving, but you can touch a GPS system all you want. I’m not saying a GPS system is any safer than a phone if you look at it while you’re driving. I’m not saying that at all. California says that. If you really want to be a law-abiding citizen, you’ll want a GPS unit in the car that you can actually respond to in a legal way. Second, built-in GPSs are disappearing. In most GM vehicles these days, you are not provided with a built-in navigation system, but rather, you get turn by turn directions if you pay for On-Star services. So, anyone who has a GM vehicle, but does not want to pay for On-Star or use data on their phone to use Google Maps or Waze, has no alternative other than a standalone GPS unit. GM does offer up to 6 months free of On-Star, but once that expires, you are out of luck. I just purchased this GPS unit from Solid Signal and could not be happier with lifetime map updates and a reliable navigation system that costs me $0/mo and does not use data! I don’t blame carmakers for taking GPS units out of their cars. A GPS for a car is going to me more expensive because it’s built to be durable. Yet, most of these units underperform compared to smartphones which have more power. Fewer people are choosing to spend money on built-in GPS systems. Some carmakers are responding with Android Auto and CarPlay, but remember those systems do use data while a standalone system won’t. Not everyone wants to walk around with one of those ginormous phones like a Galaxy Note. Maybe you just don’t have enough room in your pants pocket or maybe you just think people who do that look like massive dorks. I don’t judge, believe what you want. However, a 4″ smartphone screen is going to be very dangerous to look at compared to a 7″ GPS screen. You’ll spend more time looking at the smaller screen trying to figure out what’s going on. A bigger screen will give you bigger words that you can read more quickly. Having a standalone GPS lets you have that nice big screen when you’re navigating and a reasonably pocketable phone when you’re not. Hey, maybe you aren’t the sort of person who gets all new stuff every year. Maybe you’re holding onto that iPhone 3G or Motorola RAZR because it still works. Maybe you don’t have a data plan at all, and maybe your car doesn’t have any sort of fancy built-in screen. Different strokes for different folks, right? At least that’s what that TV show said when I was younger. There’s room for everyone and just because you personally like to tool around in a 2005 Saturn doesn’t make you a bad person. It also shouldn’t deprive you of having a good navigation experience. Just because your car was made back in the day of paper maps doesn’t mean you have to live like that. A standalone GPS gets you back in the swing of things where you belong. Style, power, and a great price. 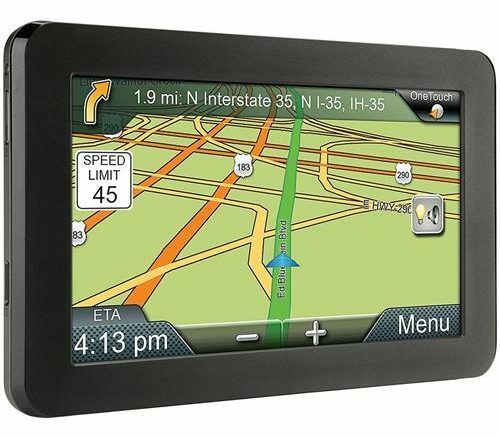 With a refurbished Magellan GPS you get clear navigation with a big screen. Mount it on your windshield if the law in your parts lets you. Otherwise mount it somewhere safe and legal. Either way, you get all the benefits of GPS, including lifetime updates, for a price that won’t set you back a ton. A few years ago this GPS would have been $200-$300 but it’s a lot less now. It’s been factory recertified to look and act like new, and with lifetime updates, you’ll know that the streets are always where they say they are. So yes, naysayers, a standalone GPS in 2018 actually does make a lot of sense. At least if it’s this one. Just how accurate is GPS, exactly?